These are photos from an ‘Energy garden’ project we are doing on a London Overground station. The intention is to have vegetables, herbs and flowers growing on the platform, with rainwater harvesting, composting, and recycling. So the vegetables and flowers have been planted and are doing well- thanks to the station staff who look after them. A mural and slate plaque are planned for later this summer. Categories: allotments, Animals, Art, benefit, Charushila, community, container gardening, creativity, ecology, engagement, environment, growing, outdoors, planting, rain water, recycle, reuse, watering plants, zero waste | Tags: children, energy, Energy Gardens, environment, flowers, food, gardening, grow | Permalink. We are doing a lecture about our work on our project about community gardens and participatory design on 11th June at 1530 hours. Please come if you can! Categories: allotments, Art, benefit, Charushila, community, compost, container gardening, creativity, engagement, environment, flowers, fruit, growing, landscape, outdoors, planting, sustainability, urban | Tags: allotments, beneficial, children, community, community consultation, community gardens, container, free, gardening, gardens, planting, re-use | Permalink. Undoubtedly the most important thing about a project of any kind is to make sure that original work is maintained as the designer wishes. This is where the community comes in. This the social capital behind any project. The above photo is taken from a new project I have been involved in Hoxton with the charity I set up, Charushila. This particular one is a community park with allotments and seating. 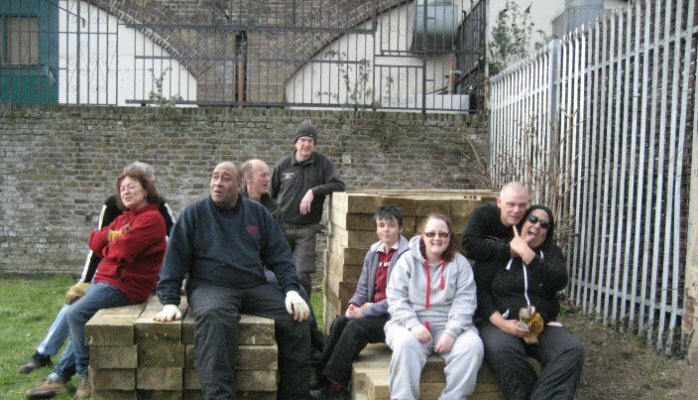 Initially we found it difficult to involve the local community but as the work moved along, that itself was an impetus to get the community involved. The other big issue these days is ‘environmental capital’. Publicly funded projects, such as this one, need ‘environmental capital’ in order to receive ‘social capita’l or indeed the funding itself. We used leftover materials from the Chelsea flower show to create the seating. 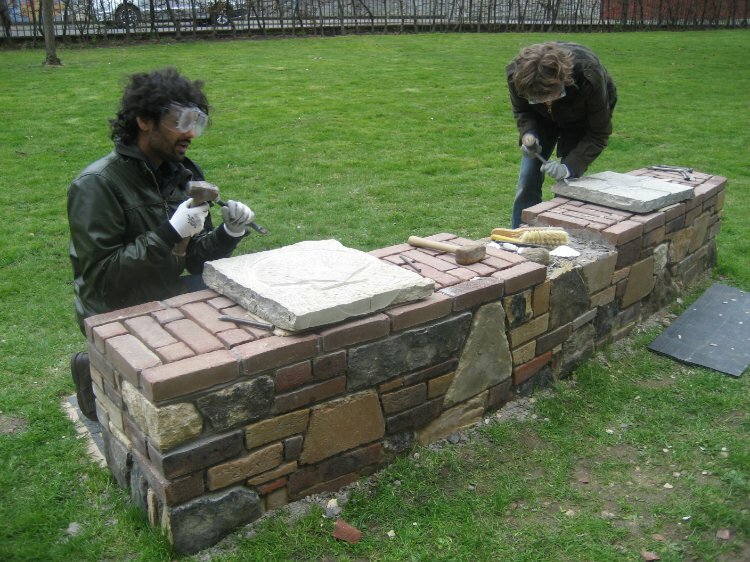 Local volunteers who were interested in learning about stone carving and masonry were recruited to work on the seating under the tutelage of the stone sculptor. While we did not save money or time by using the reclaimed stones and bricks (a large amount was taken up with the transport), that local people learned how to work with plants and stones was the most important benefit for us. Many architects are getting involved in such work because together with the social and environmental benefits, the personal satisfaction from this kind of work is immense, although this is not ‘architectural work’ in a narrow sense. And academic institutions are also thinking along these lines to offer support for this kind of work that perhaps new graduates might turn to. This academic year, the Pratt Institute will introduce a new master’s program in designing public spaces through community planning. The ‘Urban Placemaking and Management’ degree, within the institute’s architecture school. This course is led by the British born architect David Burney from Liverpool, who was responsible for the Times Square’s pedestrian-friendly makeover as the New York City’s commissioner of design and construction. The course, the first of its kind in the USA, will focus on community planning processes and creating great public places, according to the school. Courses include topics like ‘history and theory of public space, open space and parks,and the economics of place’. These aspects of are of prime importance as they focus on spaces between buildings and what happens there is a key social marker (is that space being used for crime or community space?). A very welcome course for a changing world. Categories: allotments, Charushila, community, garden, seating | Tags: allotments, children, community gardens, environmental capital, gardens, social capital | Permalink.